Celebrity photos - Welcome to "Close Guantánamo"
This page features photos of celebrity supporters of the "Countdown to Close Guantánamo" campaign, and other well-known and significant figures -- former Guantánamo prisoners, former members of the U.S. military, and prominent campaigners, for example. 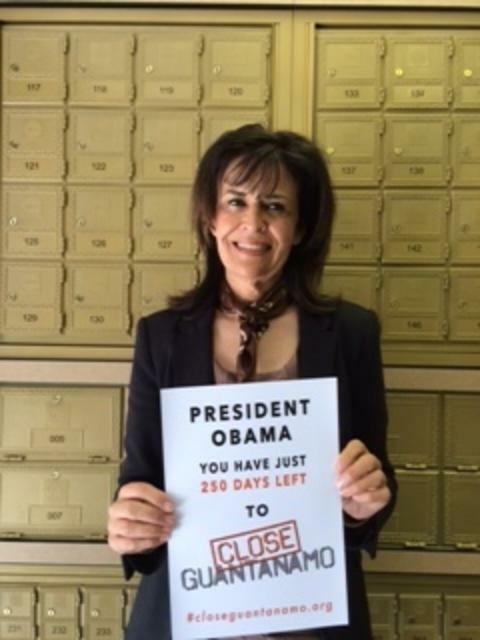 The campaign, launched on Jan. 20, 2016, counts down the last year of the Obama presidency and calls for President Obama to fulfill his promise to close the prison. 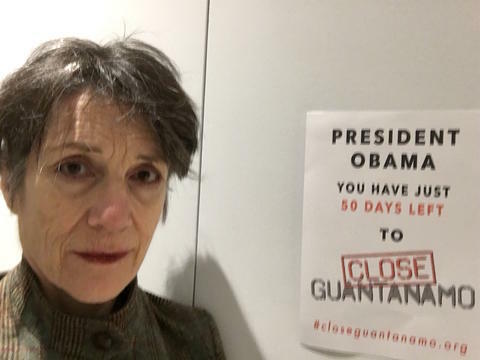 To get involved, print off the poster for "5 days to go" on Jan. 14, take a photo of yourself with it, and send it to us -- with a message if you wish. You can also let us know where you're from, if you'd like. 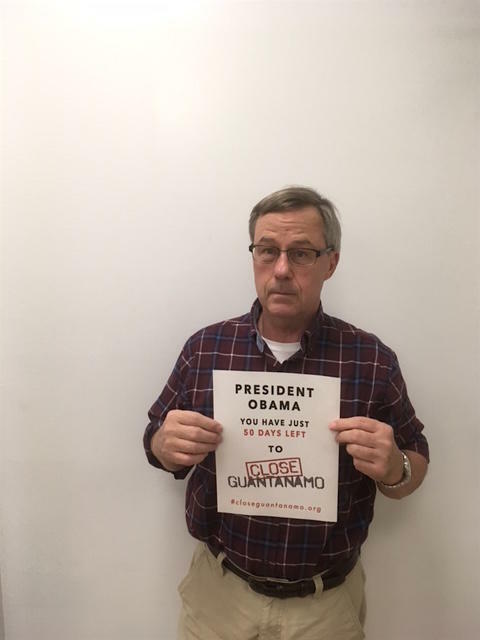 We believe that the campaign to close Guantánamo has renewed urgency after Donald Trump's election victory, because he promised on the campaign trial to keep Guantánamo open, to add to its population, and to reintroduce torture, and because of his tweet on Jan. 3 calling for no more releases from Guantánamo. To show our concern, we have posters prepared for every one of the five days before Trump's inauguration -- "4 days to go" is on Jan. 15, "3 days to go" is on Jan. 16, "2 days to go" is on Jan. 17, and "1 day to go" is on Jan. 18, to be followed by a new poster aimed at Donald Trump! Please feel free to take photos with as many posters as you wish, and to send them to us. Also see the photos of members of the public from around the world here (from 1 year to 300 days) and here (from 250 days onwards), and also here (from 150 days and 100 days), and from 70 days onwards here. The latest page -- of photos from "15 days to go" onwards -- is here. For further information about the aims of the campaign, see our article, The "Countdown to Close Guantánamo" Launches: Send in Your Photos Asking President Obama to Fulfill His Promise to Close the Prison, and watch Roger Waters and "Close Guantánamo" co-founder Andy Worthington discussing the launch with Amy Goodman on Democracy Now! Dr. Adel Safty (Vancouver, Canada) is a retired international law professor, and author of several books on the Middle East. As a former columnist with Gulf News, he wrote critically of the American military's use of torture and abuse in Iraq, in Guantánamo, and Afghanistan. Dr. Safty is deeply disappointed that President Obama has failed to keep his promise to close Guantánamo, and says we must continue to work to free the 45 people still languishing there. 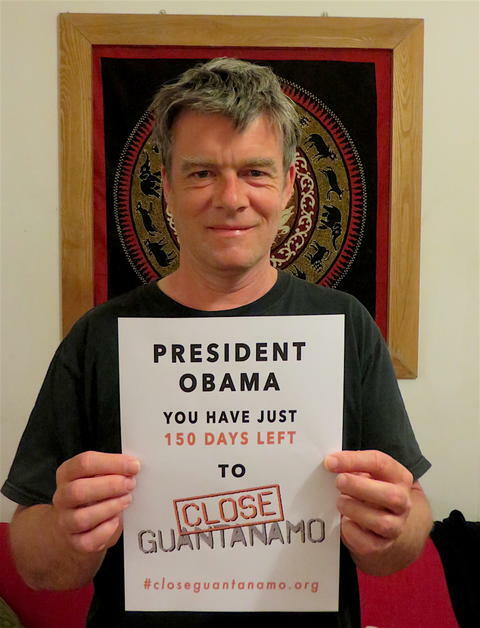 Andy Worthington, the co-founder of the Close Guantánamo campaign, says, from New York City, during his current visit to call for the closure of Guantánamo on and around the 15th anniversary of the prison’s opening (on Jan. 11), "So you have just 48 hours left, President Obama. We are all delighted to hear that another ten men have been released in Oman, and await news of further releases imminently. However, for the 40-odd men left, doing nothing is not an option. Exercise your power at the last minute, and get these men to the mainland, thwarting the deluded Donald Trump and the malignant Guantánamo-loving Republicans before they get their hands on this vile symbol of US overreach and injustice." 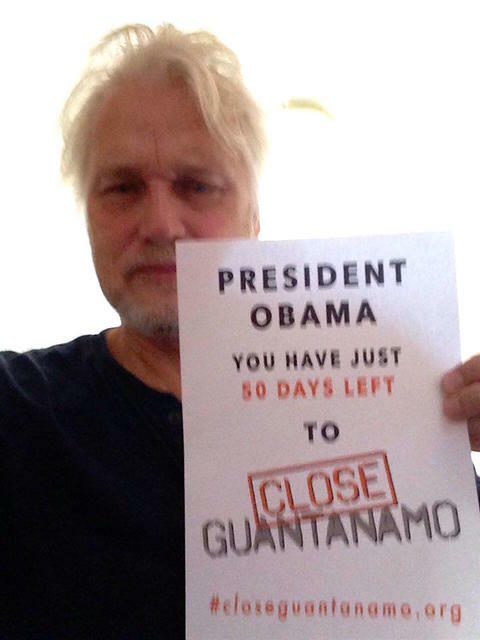 Erling Borgen, Norwegian journalist and director of the documentary film, Death in Camp Delta, about the three alleged suicides at the prison in June 2006, says, "Guantánamo is a shame. Nine dead, torture, outside the law. 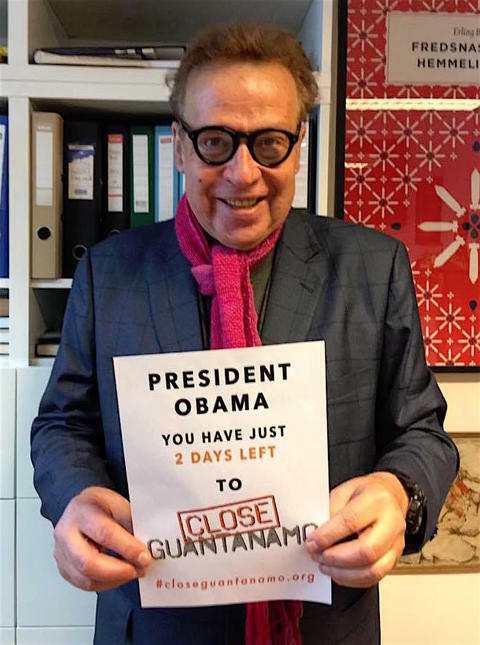 As a Norwegian I have been engaged in the campaign to close Guantánamo, because Norway participated in the Afghanistan war, and because a Norwegian company had 600 employees at the torture base. They constructed the prison cells and the training site for the torture dogs. They also fueled the rendition flights among many other things." 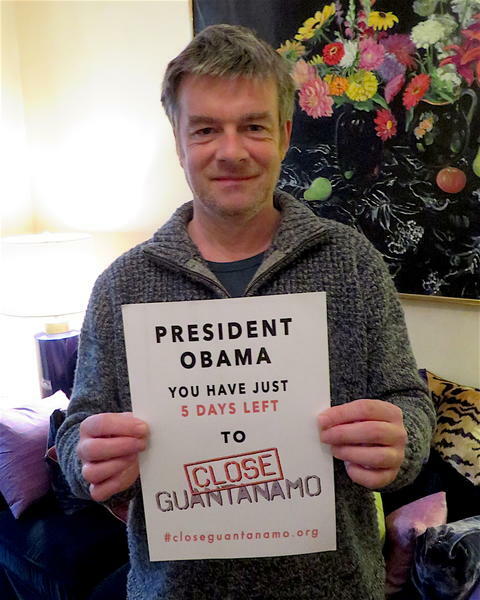 Andy Worthington, the co-founder of the Close Guantánamo campaign, says, from New York City, during his current visit to call for the closure of Guantánamo on and around the 15th anniversary of the prison’s opening (on Jan. 11), "With just five days left of his presidency, I can only ask President Obama to listen to the 40 members of the Congressional Progressive Caucus, including John Lewis, Seth Moulton, John Conyers, Keith Ellison and Barbara Lee, who, in a letter on Jan. 11, wrote, '[W]ith only days before your term ends, we ask that you definitively close the site by rapidly pursuing any and all options within your existing authority to seek lawful disposition of all of the 55 remaining individuals languishing in the camp. Mr. Trump must be deprived of the use of Guantánamo Bay.'" 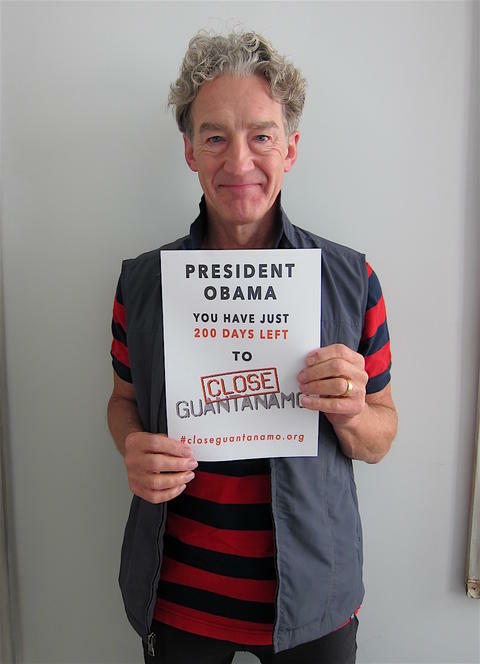 Actor and director Mark Rylance, recently knighted, supports the Countdown to Close Guantánamo. 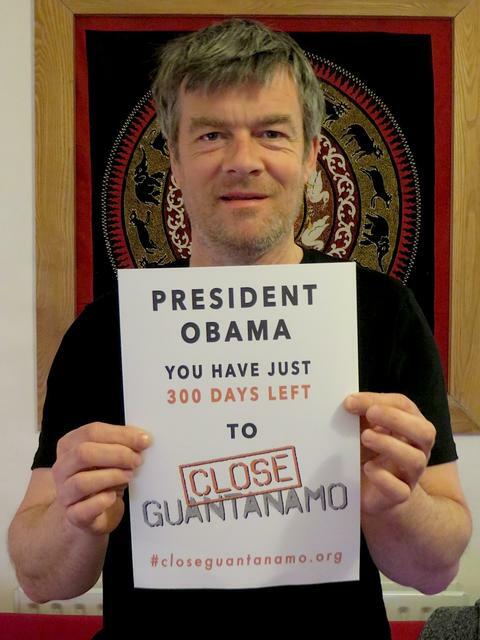 Mark previously supported the We Stand With Shaker campaign, which campaigned to secure the release from Guantánamo of Shaker Aamer, the last British resident in the prison, who was freed in October 2015. 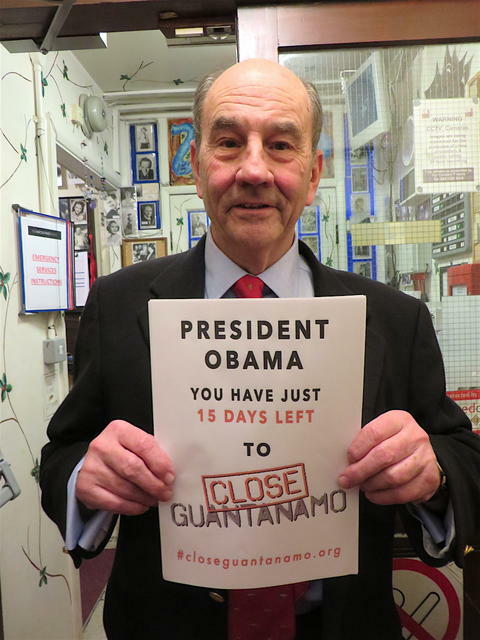 With just 15 days to go until the end of the Obama presidency, Tom Wilner, the co-founder of the Close Guantánamo campaign and counsel of record to the Guantánamo prisoners in their Supreme Court cases in 2004 and 2008 that established their right to habeas corpus, calls for President Obama to finally close the prison before he leaves office. 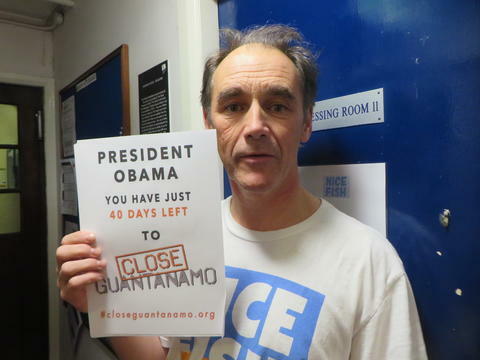 Actor and director Mark Rylance supports the Countdown to Close Guantánamo. 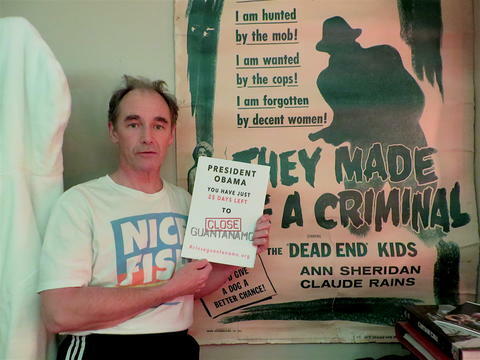 Mark previously supported the We Stand With Shaker campaign, which campaigned to secure the release from Guantánamo of Shaker Aamer, the last British resident in the prison. 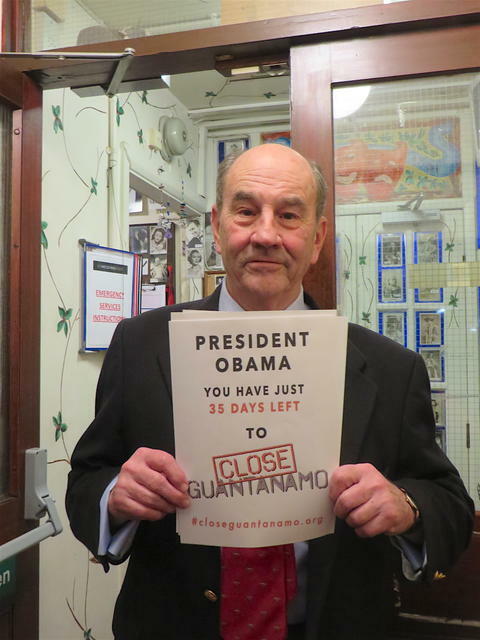 Attorney Tom Wilner is the co-founder of the Close Guantánamo campaign. Tom also represented Kuwaiti prisoners at Guantánamo, and was counsel of record to the Guantánamo prisoners in the two Supreme Court cases (Rasul v. Bush and Boumediene v. Bush) that established their right to habeas corpus and in the separate case (Al Odah v. United States) that established their right to counsel. 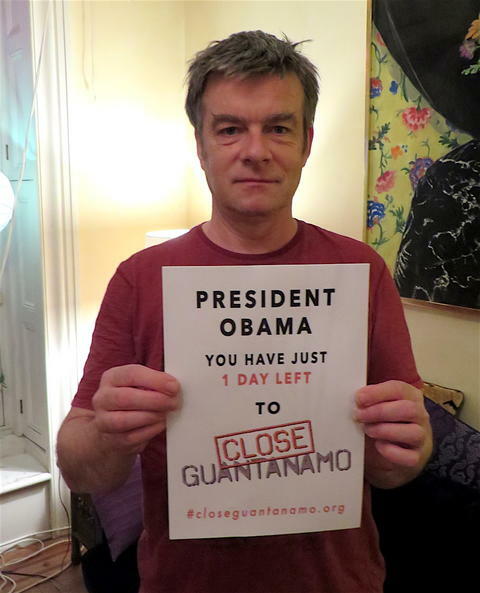 Andy Worthington, co-founder of the Close Guantánamo campaign, says, "One month to go, President Obama, and we are still watching, and waiting for justice for the men still held. Today, we’ve heard that you will be releasing 17 or 18 of the 22 men approved for release (out of the 59 still held) before Donald Trump inherits the prison from you, but we urge you to do more. Close it. Issue an executive order and bring the remaining men to the U.S. mainland. Make it as hard as possible for Donald Trump to keep it open." Ben Griffin, coordinator for Veterans for Peace UK, London. 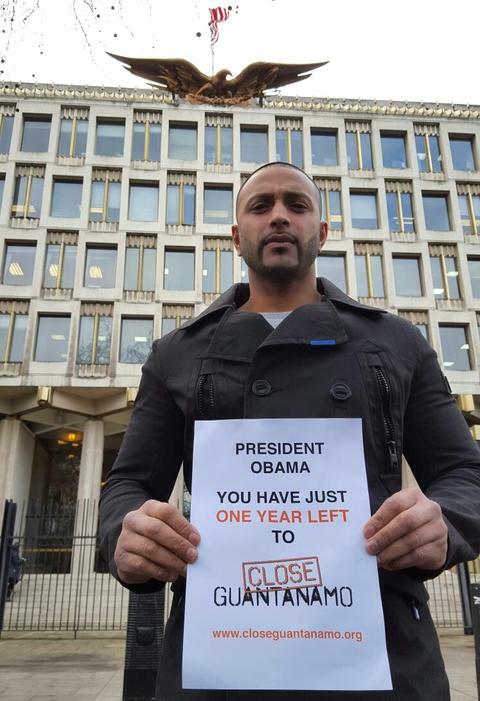 Former Guantánamo prisoner Djamel Ameziane, who was released from Guantánamo three years ago, after being held for 11 years without charge or trial, supports the Countdown to Close Guantánamo. 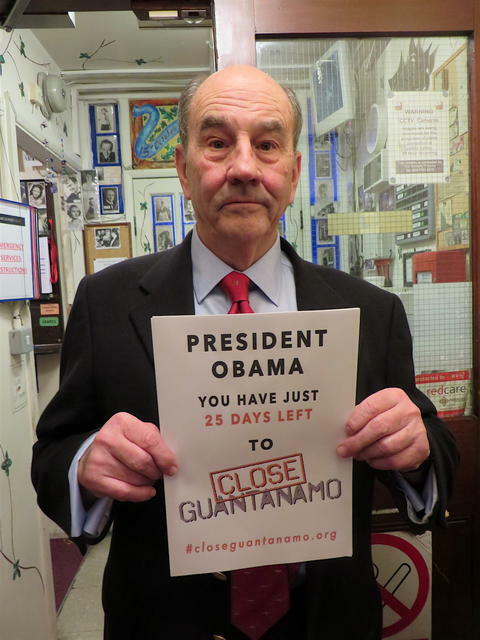 Attorney Tom Wilner, the co-founder of the Close Guantánamo campaign, supporting the Countdown to Close Guantánamo. Tom also represented Kuwaiti prisoners at Guantánamo, and was counsel of record to the Guantánamo prisoners in the two Supreme Court cases (Rasul v. Bush and Boumediene v. Bush) that established their right to habeas corpus and in the separate case (Al Odah v. United States) that established their right to counsel. 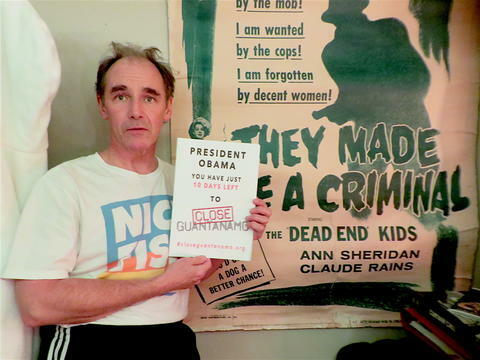 Actor, director and playwright Mark Rylance supports the Countdown to Close Guantánamo on Human Rights Day, which commemorates the United Nations' ratification, on December 10, 1948, of the Universal Declaration of Human Rights. The UDHR codified, for the first time, what rights we should all have, including the right not to be "subjected to arbitrary arrest" or torture. 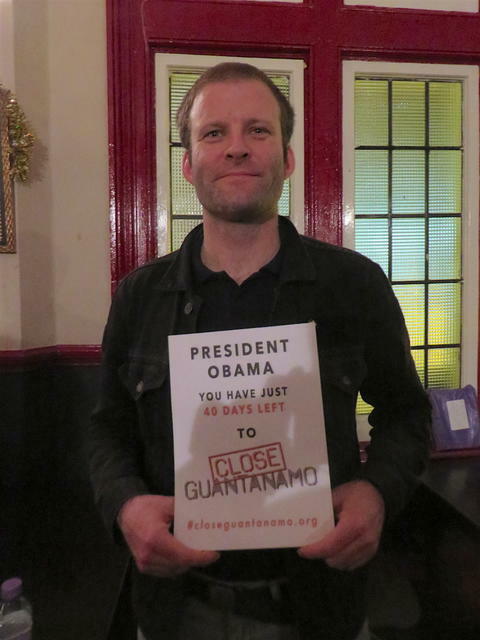 Mark previously supported the We Stand With Shaker campaign, which campaigned to secure the release from Guantánamo of Shaker Aamer, the last British resident in the prison. 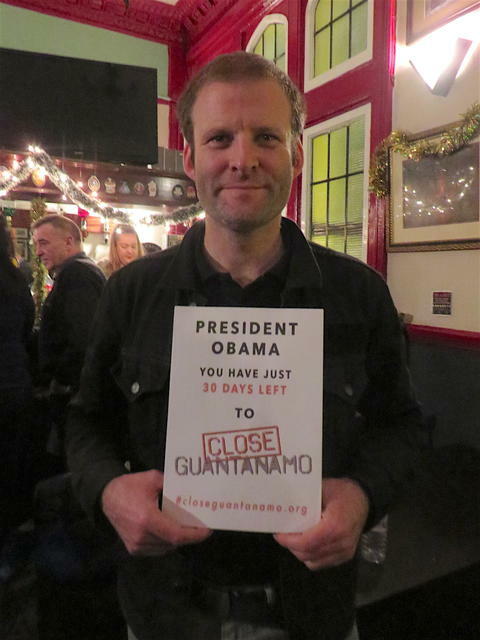 Ben Griffin, coordinator for Veterans for Peace UK, supports the Countdown to Close Guantánamo on Human Rights Day, which commemorates the United Nations' ratification, on December 10, 1948, of the Universal Declaration of Human Rights. The UDHR codified, for the first time, what rights we should all have, including the right not to be "subjected to arbitrary arrest" or torture. 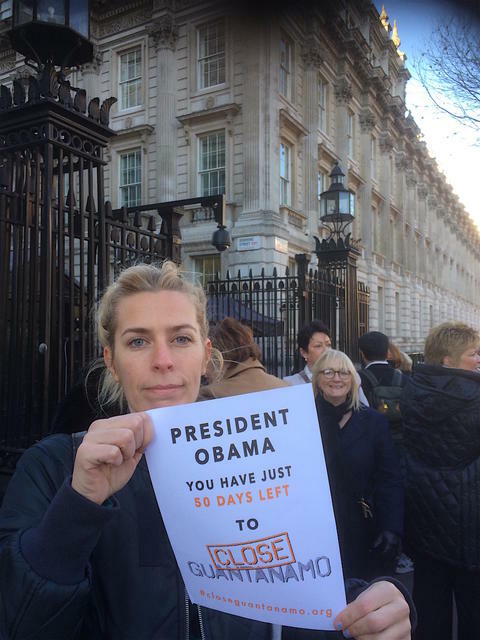 The comedian Sara Pascoe supports the Countdown to Close Guantánamo and previously recorded a video with Frankie Boyle for the We Stand With Shaker campaign. 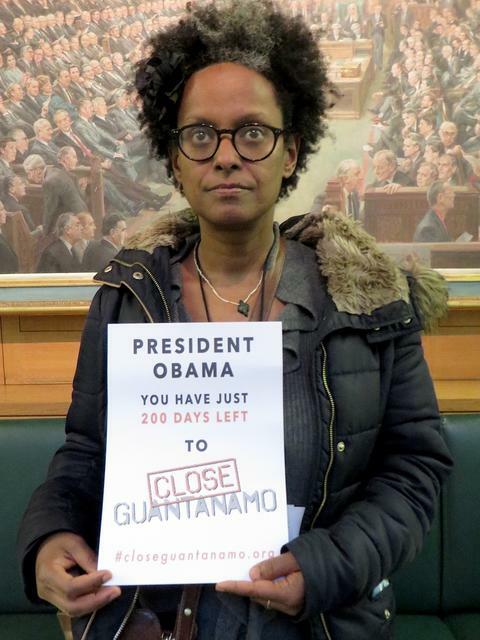 She was photographed at 10 Downing Street, where she was part of a delegation handing in a petition urging the U.K. government to do more to help Andy Tsege, the British citizen kidnapped and held without trial by the Ethiopian government. 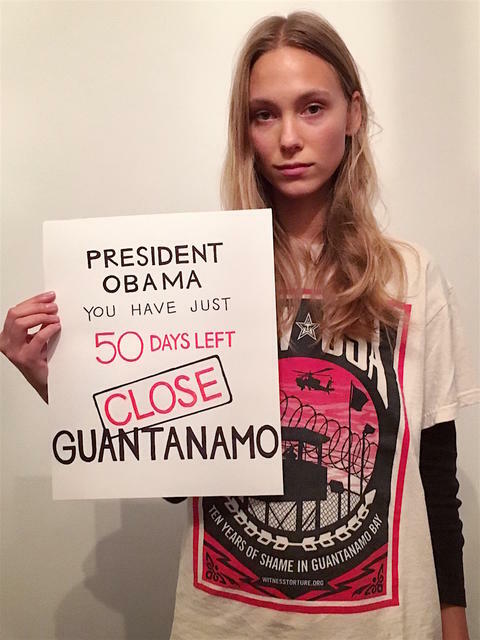 Zuzanna Krzatala, student and model, in New York City, supports the Countdown to Close Guantánamo with this home-made poster. 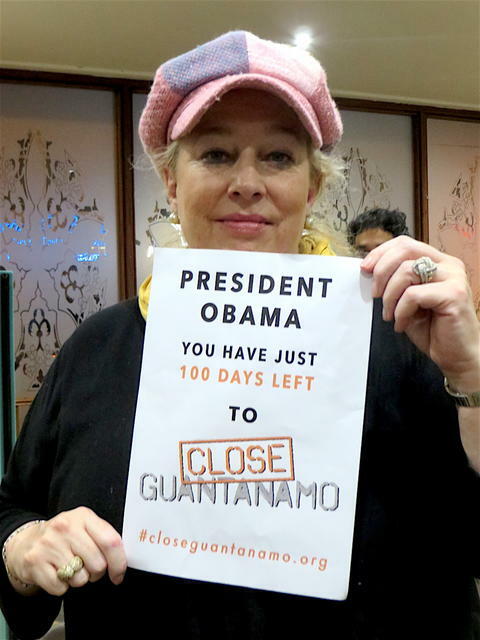 She says, "Trump's imminent threat has foreshadowed all the other news and it seems the world has forgotten about Guantánamo. This is our last shot, I'm with you!" Zuzanna also posted her photo on her Instagram page. Todd Pierce, Major, U.S. Army Judge Advocate General Corps (retired), represented Guantánamo prisoners as a military defense attorney in their military commission trials. The actress Harriet Walter in London. 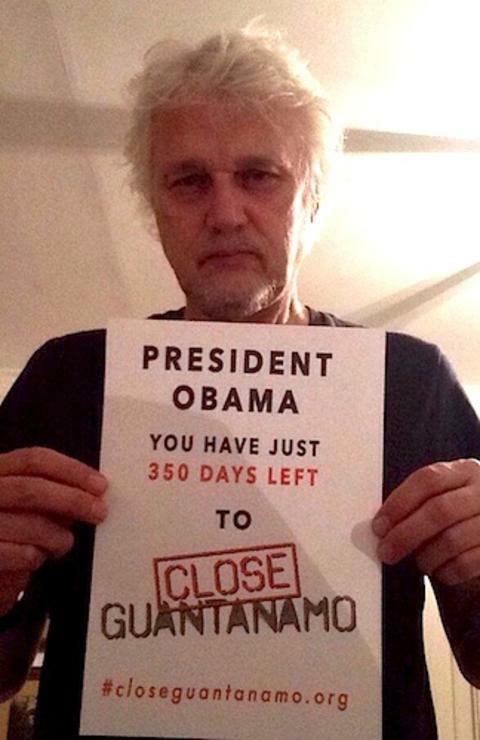 The musician David Knopfler, a founder member of Dire Straits, is a longtime supporter of the campaign to close Guantánamo. 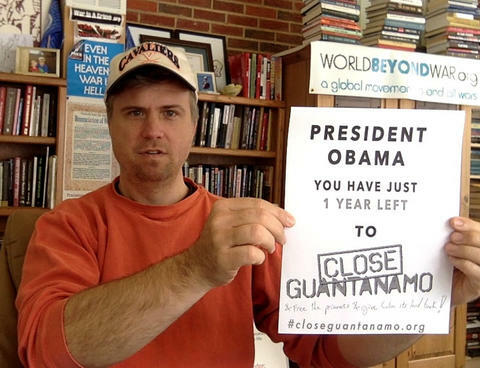 German journalist Ludwig Watzal says, "Almost eight years ago you promised to the world to close the prison camp at Guantánamo Bay within one year. You haven't kept this, but many other promises, too. Perhaps it comes with the office of the U.S. presidency that incumbents change so rapidly. 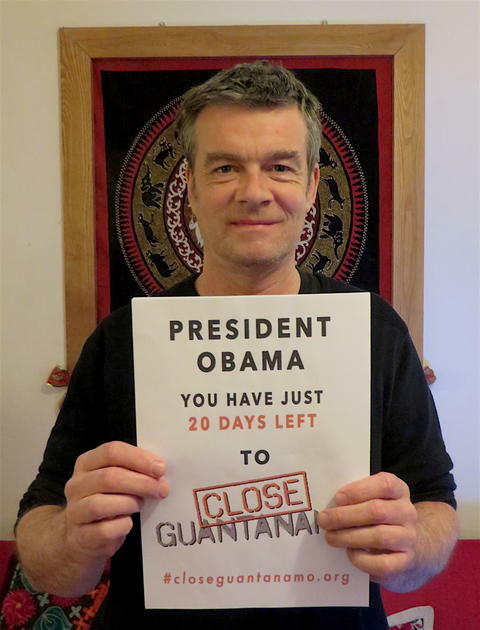 During your presidency, you have released many prisoners that were all found innocent. Set the remaining prisoners free and take the three or four so-called high-security detainees to the military detention center at Fort Leavenworth, Kansas. where the innocent Chelsea Manning is serving a 35-year prison term. Manning did a great job to the U.S. by exposing to the world the wickedness of parts of the American military. These very few so-called terrorists should stand trial before a regular court in which they can defend themselves. The so-called confessions at Guantánamo all came under torture. The established kangaroo courts at Guantánamo stand for a travesty of justice. Is this the American way? "Nothing is as bad as it looks. One can only hope that this saying applies also to President-elect Donald Trump. But it makes one shiver reading his so-called campaign promises concerning Guantánamo and the treatment of Muslims in the U.S. and elsewhere: As a presidential candidate, he vowed to refill the cells of the Guantánamo Bay prison and said American terrorism suspects should be sent there for military prosecution. He further called for targeting mosques for surveillance, escalating airstrikes aimed at terrorists and taking out their civilian family members, and bringing back waterboarding and a ‘hell of a lot worse’. He really thinks that ‘torture works’ would work, and, even if it doesn’t work, ‘they deserve it anyway.’ Hopefully, as U.S. President he won't stick to his guns. And where will Trump load Guantánamo up with so-called ‘bad dudes’? "President Obama, please opt for the lesser evil and set all the prisoners free, pardon Chelsea Manning and Edward Snowdon and let Julian Assange go his own way." Former Guantánamo prisoner Shaker Aamer, released from Guantánamo in October 2015 after nearly 14 years in US custody without charge or trial. 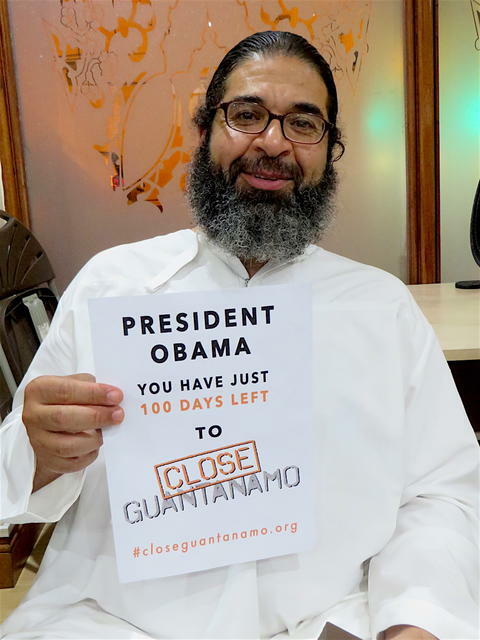 For the Countdown to Close Guantánamo, Shaker recorded a video message to President Obama urging him to close the prison, as he promised, because "in the future the whole world will remember that you did something great." The video, recorded by Close Guantánamo co-founder Andy Worthington, is on YouTube here and on Facebook here. 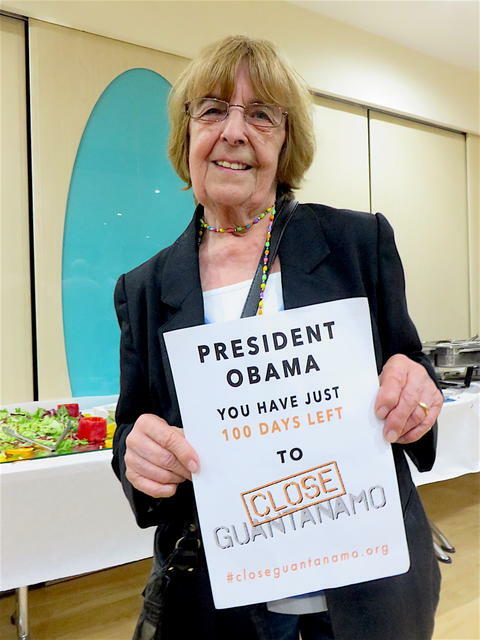 Yvonne Ridley, journalist and broadcaster, supports the Countdown to Close Guantánamo. Her latest book, just published, is Torture: Does It Work? Interrogation Issues and Effectiveness in the Global War on Terror, published by Military Studies Press. 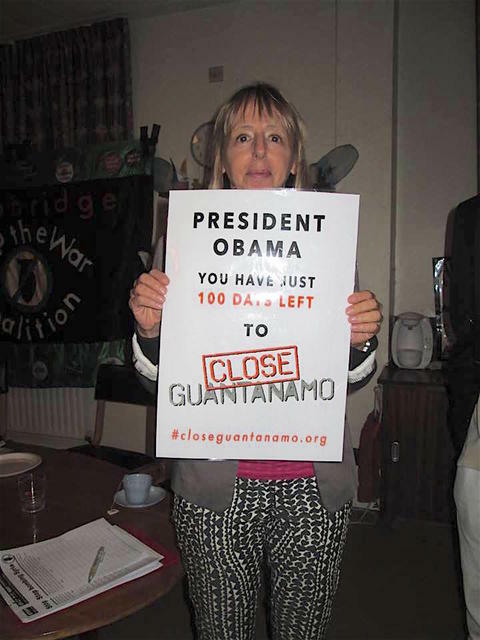 Joy Hurcombe, the chair of the Guantánamo Justice Campaign, formerly the Save Shaker Aamer Campaign, which worked tirelessly to secure the release from Guantánamo of Shaker Aamer, the last British resident in the prison. 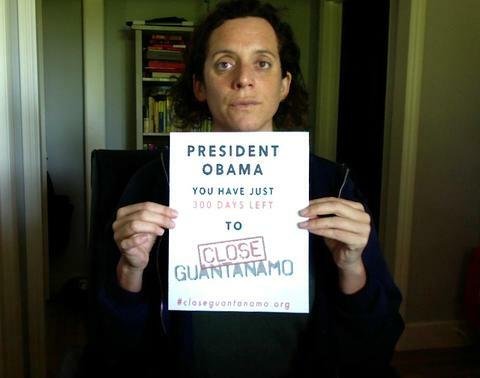 Joanne MacInnes, the co-founder of the We Stand With Shaker campaign, which worked to secure the release from Guantánamo of Shaker Aamer, the last British resident in the prison. She now works as a campaigner for refugees and for the British citizen Andy Tsege, imprisoned without charge or trial in Ethiopia. 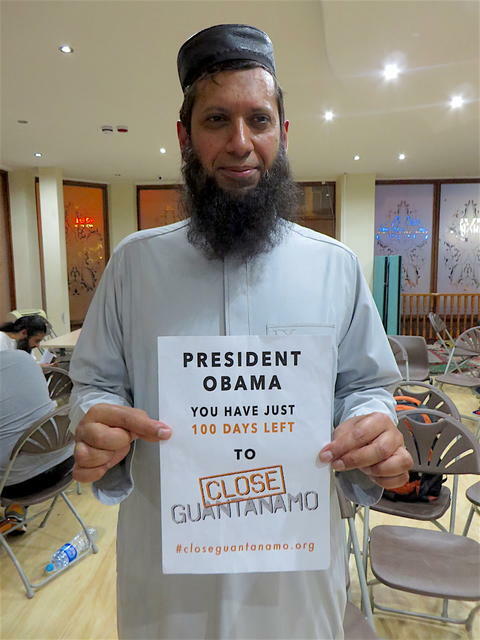 Shaykh Suliman Gani supports the Countdown to Close Guantánamo. A long-time supporter of the campaign to free Shaker Aamer, the last British resident in the prison, he was photographed at an event in Tooting, in south west London, to thank everyone who stood by him earlier this year when he was the victim of lies told by senior Conservatives, including David Cameron, Zac Goldsmith and Michael Fallon. 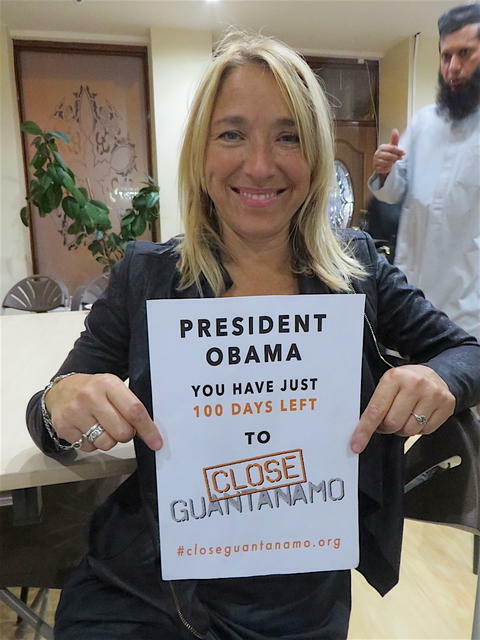 Medea Benjamin, the co-founder of CODEPINK: Women for Peace, supports the Countdown to Close Guantánamo. This photo was taken at an event organised by Cambridge Stop the War Coalition on October 5, 2016. 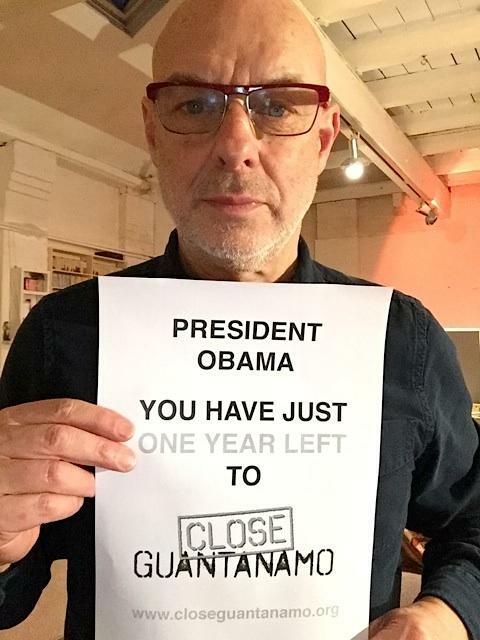 Humberto Robles, Mexico's most widely presented living playwright, whose works have been performed in over 26 countries, supports the Countdown to Close Guantánamo. Dr. David Nicholl, neurologist and human rights campaigner, UK. 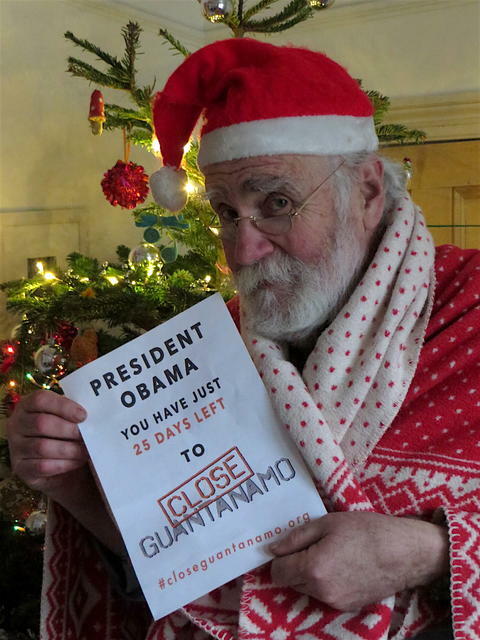 David has been a longtime opponent of Guantánamo, and, in April 2015, ran around the White House calling for the release of Shaker Aamer, the last British resident in the prison, who was finally freed last October. Nilantha Ilangamuwa, journalist (editor of the Sri Lanka Guardian) and author. Marya Zaborowski, editor, Asian Human Rights Commission. 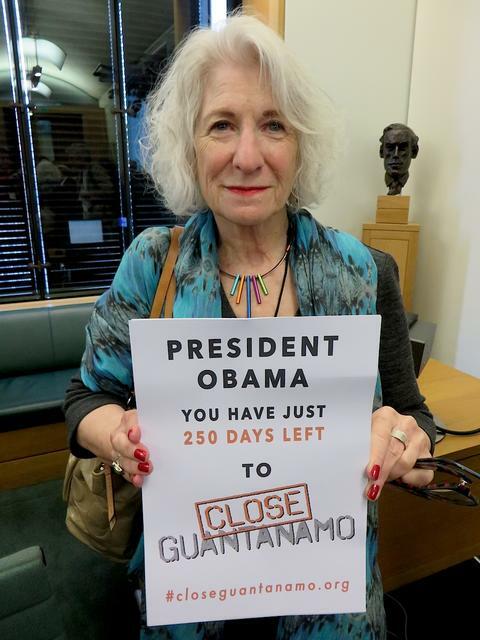 Psychologist and film-maker Martha Davis (who made the powerful and important documentary Doctors of the Dark Side) supports the Countdown to Close Guantánamo. 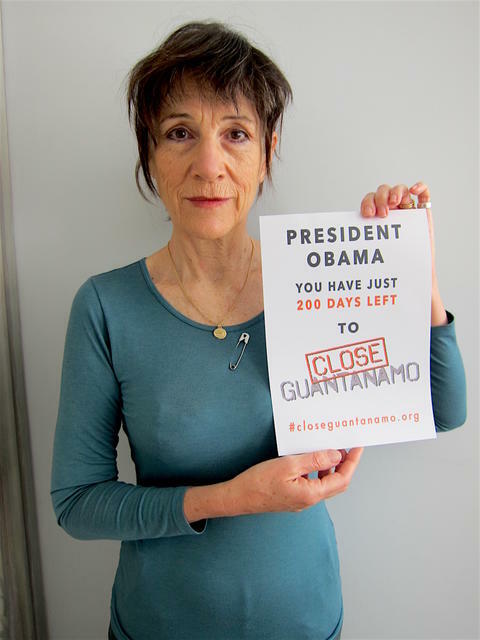 Actress Harriet Walter supports the Countdown to Close Guantánamo, and says, "Closing Guantánamo is so, so important." 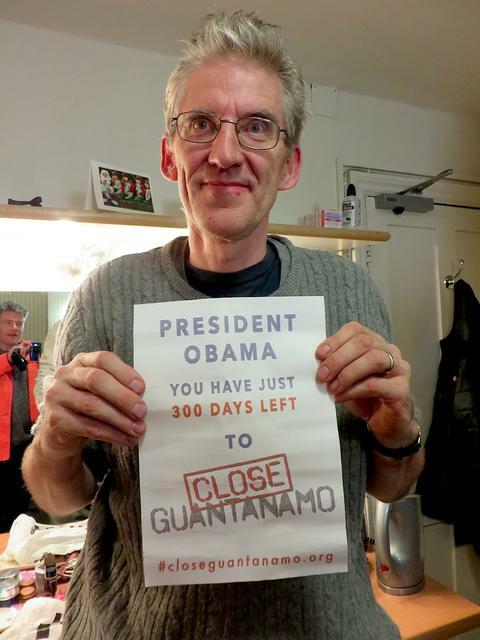 Actor Guy Paul, married to Harriet Walter, supports the Countdown to Close Guantánamo. 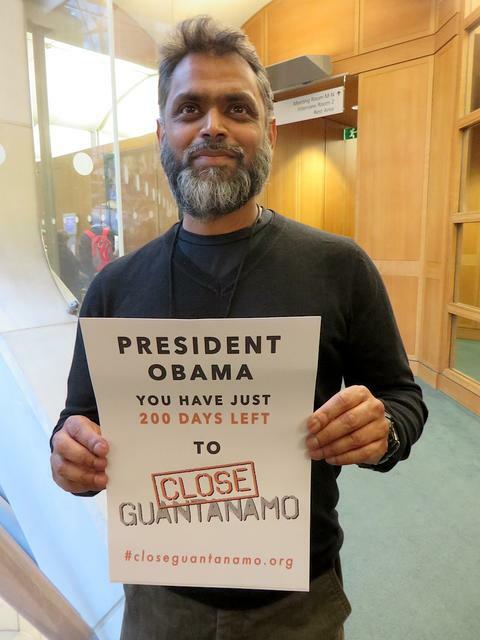 Former Guantánamo prisoner Moazzam Begg says to President Obama, for U.S. 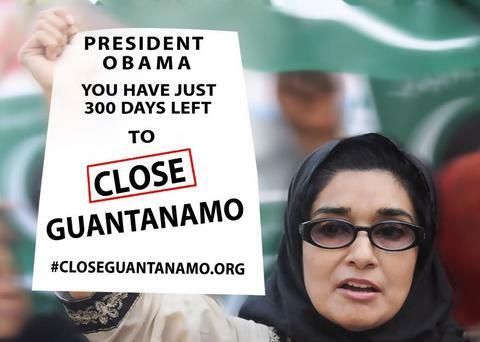 Independence Day, "We are watching and waiting for you to fulfill your promise to close Guantánamo before you leave office." 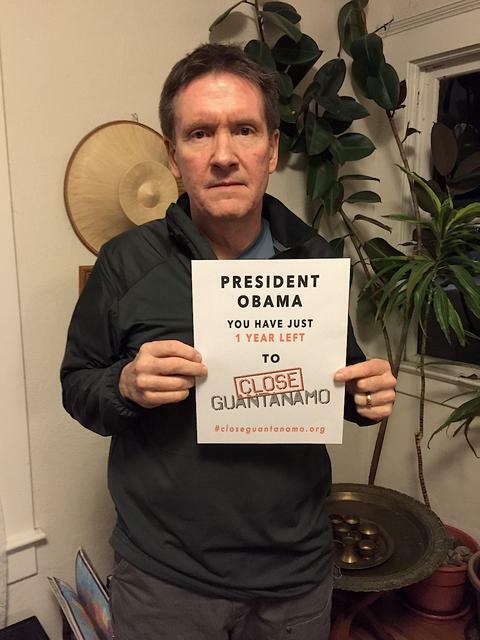 Close Guantánamo co-founder Andy Worthington tells President Obama, for U.S. Independence Day, "The eyes of the world are on you, Mr. President. You promised seven and a half years ago to close Guantánamo within a year, but you never managed to fulfill that promise, and now, so many long years later, time is running out. It is crucial for America's standing in the world -- and for your legacy -- that Guantánamo is closed before you leave office." 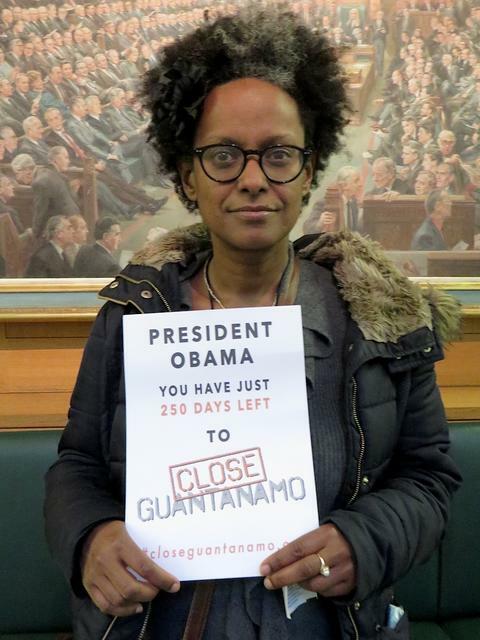 Yemi Hailemariam, the partner of unlawfully imprisoned Ethiopian political figure Andy Tsege (Andargachew Tsege), supports the Countdown to Close Guantánamo. As his lawyers at Reprieve explain, two years ago Andy "was kidnapped and rendered to Ethiopia on the command of the Ethiopian government as part of a brutal crackdown on political opponents and civil rights activists." He was "held in secret detention and in solitary confinement for over a year, without access to any form of due process. He has been paraded on Ethiopian TV looking ill and gaunt. He was given an in absentia death sentence in 2009, he could be executed at any time." Shamefully, however, the British government has refused to act decisively on Andy's behalf. To take action for Andy, email your MP, and sign the petition, which currently has nearly 130,000 signatures. 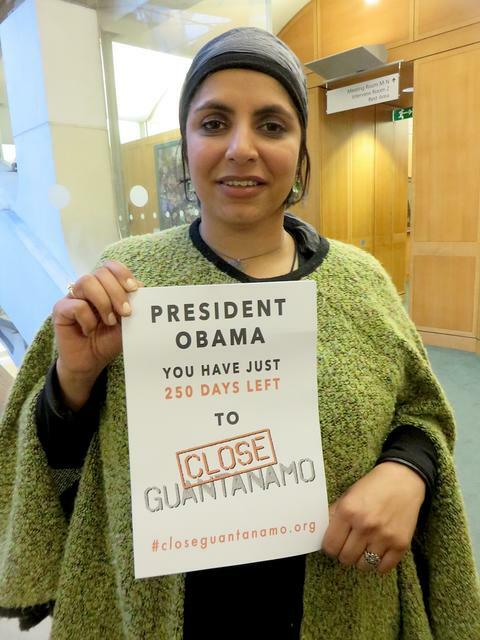 Saleyha Ahsan, doctor, journalist and human rights activist, supports the Countdown to Close Guantánamo. 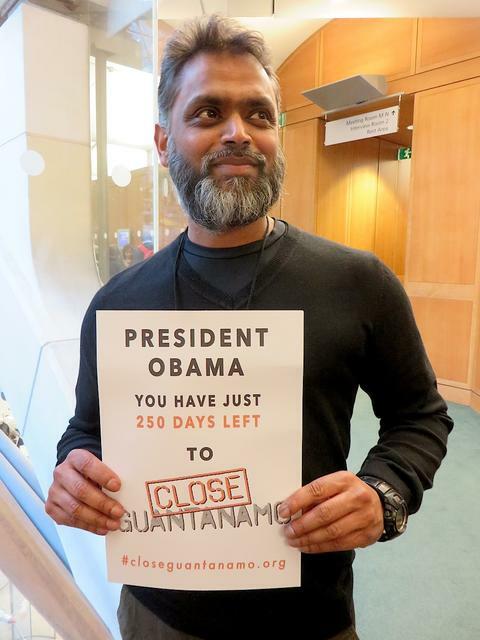 Former Guantánamo prisoner Moazzam Begg supports the Countdown to Close Guantánamo. 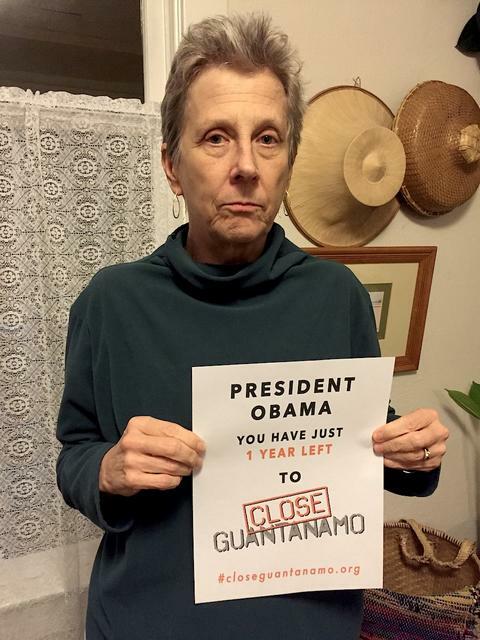 Nancy Hollander, the attorney for Mohamedou Ould Slahi, Guantánamo prisoner and best-selling author (of Guantánamo Diary), supports the Countdown to Close Guantánamo. 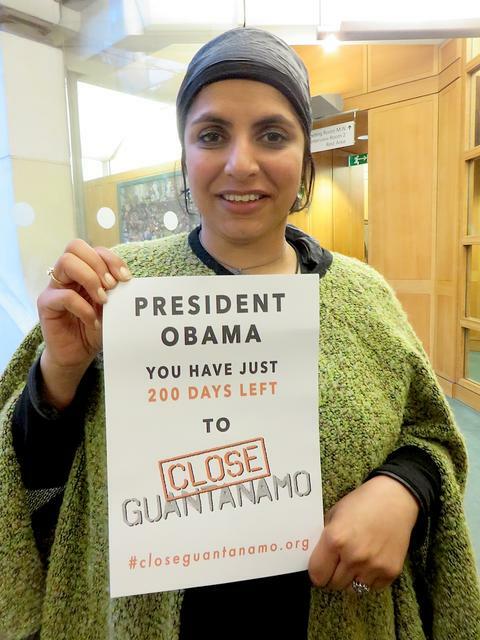 Nancy was photographed by Close Guantánamo co-founder Andy Worthington at a Parliamentary meeting for Slahi in April. Please sign the petition to U.S. defense secretary Ashton Carter, calling for Slahi to be freed, which currently has nearly 35,000 signatures. 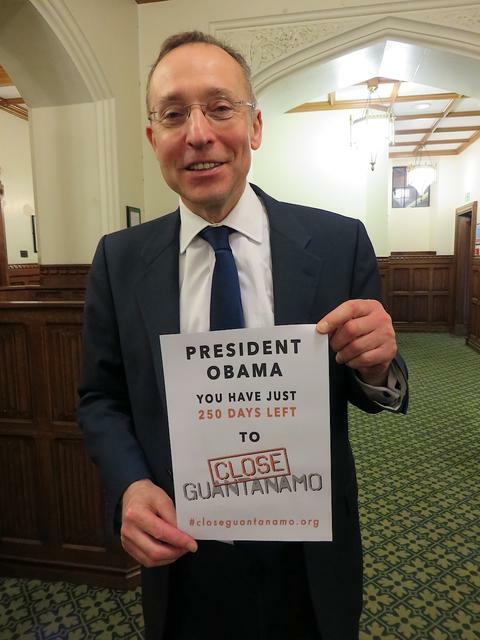 Andy Slaughter, the Labour MP for Hammersmith, and the shadow minister for human rights, supports the Countdown to Close Guantánamo. 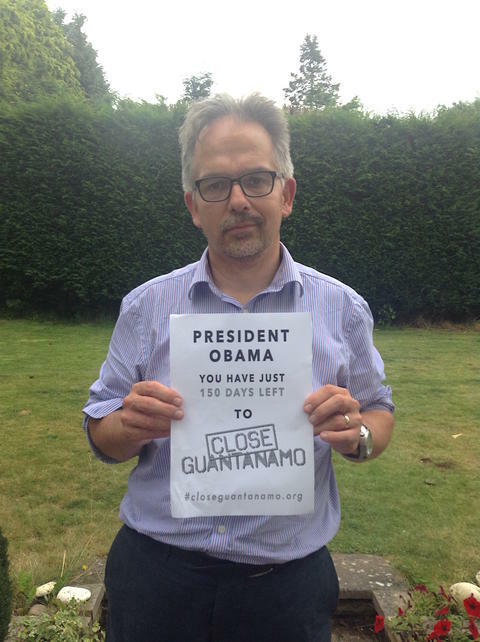 Andy was a key supporter of the We Stand With Shaker campaign, which played a part in successfully securing the release of Shaker Aamer, the last British resident in Guantánamo, last October, and is part of a current Parliamentary group supporting President Obama in his stated aim of closing Guantánamo before he leaves office. 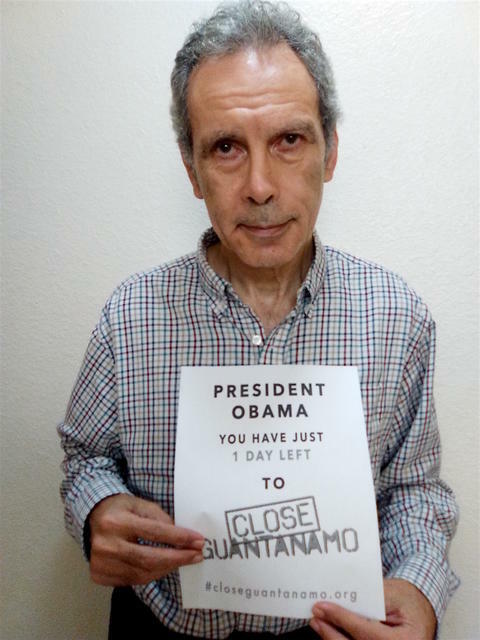 Yahdih Ould Slahi, the brother of Mohamedou Ould Slahi, Guantánamo prisoner and best-selling author (of Guantánamo Diary), supports the Countdown to Close Guantánamo. 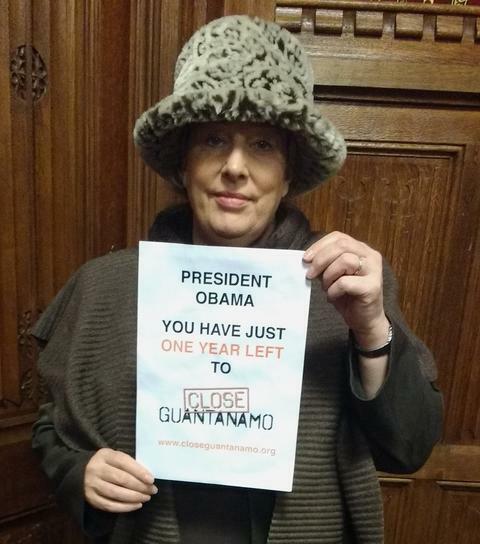 Nancy was photographed by Close Guantánamo co-founder Andy Worthington at a Parliamentary meeting for Slahi in April. Please sign the petition to U.S. defense secretary Ashton Carter, calling for Slahi to be freed, which was initiated by Yahdid, and currently has nearly 35,000 signatures. 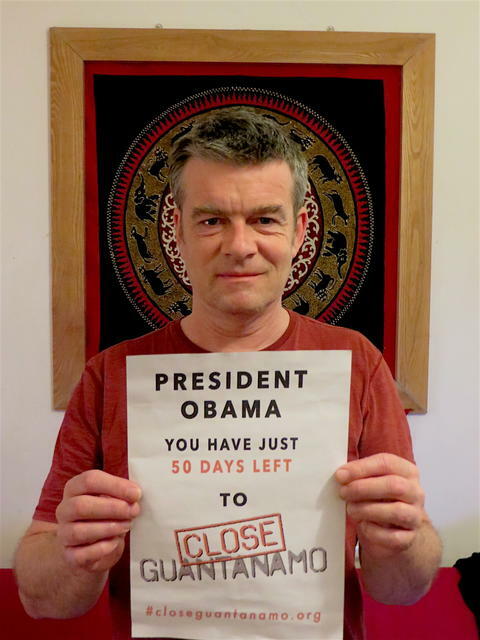 Yemi Hailemariam, the partner of unlawfully imprisoned Ethiopian political figure Andy Tsege (Andargachew Tsege), supports the Countdown to Close Guantánamo. As his lawyers at Reprieve state, "In June 2014 he was kidnapped and rendered to Ethiopia on the command of the Ethiopian government as part of a brutal crackdown on political opponents and civil rights activists. After being kidnapped, Andy was held in secret detention and in solitary confinement for over a year, without access to any form of due process. He has been paraded on Ethiopian TV looking ill and gaunt. He was given an in absentia death sentence in 2009, he could be executed at any time. Despite this, the British government refuses to act." To take action forAndy, email your MP, and sign the petition, which currently has nearly 130,000 signatures. Dr. David Nicholl, neurologist & human rights activist. 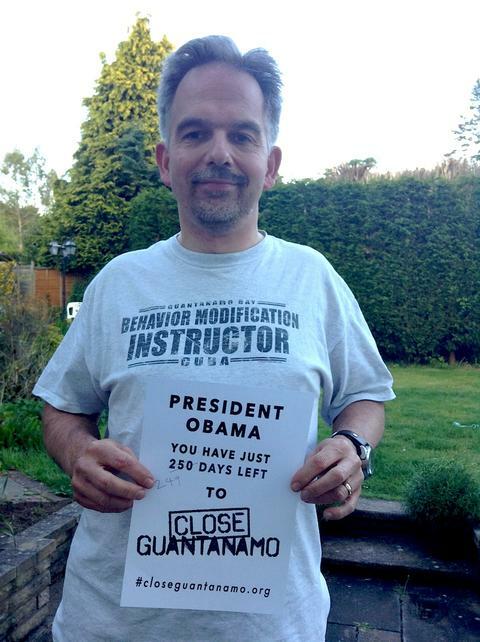 David says, "Yes, that T-shirt sadly is from Gitmo." Anna Perera, author of the young adult novel Guantánamo Boy and books for children. 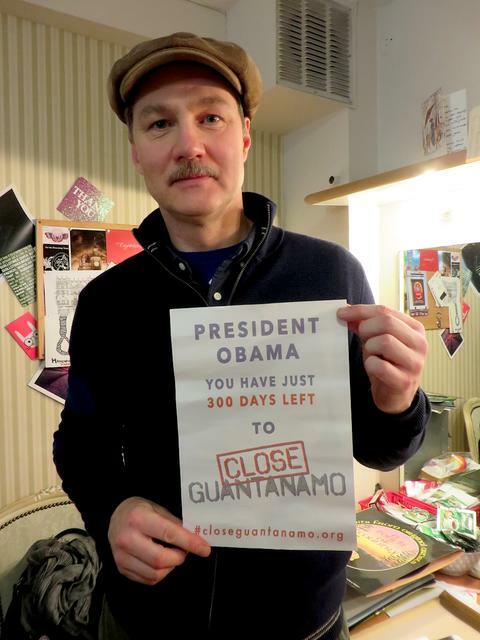 The actor David Morrissey supports the Countdown to Close Guantánamo. 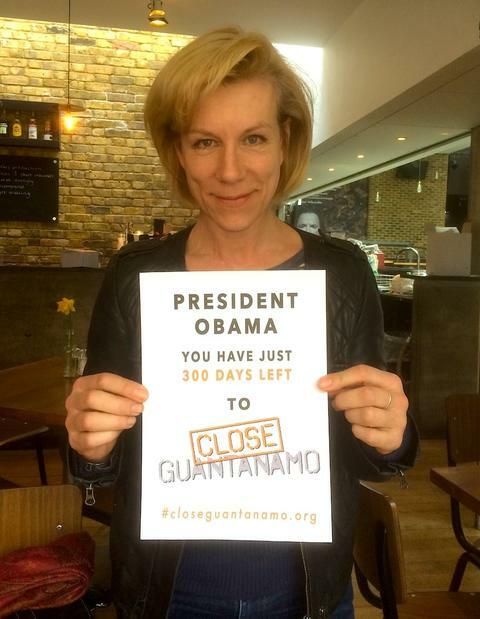 The actress Juliet Stevenson supports the Countdown to Close Guantánamo. 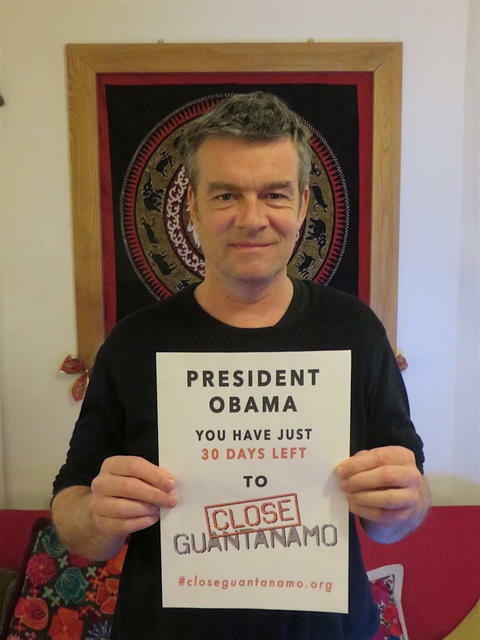 Clive Stafford Smith, the founder of Reprieve, supports the Countdown to Close Guantánamo. The actress and activist Caroline Lagerfelt says, "Dear Andy, Thank you for your leadership role in the fight." Deborah Kory (PsyD) from Berkeley, California, says, " I'm a psychologist who has researched, written and reported on the psychology profession's complicity with and powerful influence on the torture regime at Guantánamo and other CIA black sites. Here are a couple of articles I wrote for Huffington Post about it: Bad Therapy: Something Is Rotten in the Psychology Profession and Our Psychological Crisis: Making Sense of the American Psychological Association’s Collusion with Torture. Thank you for your important work." 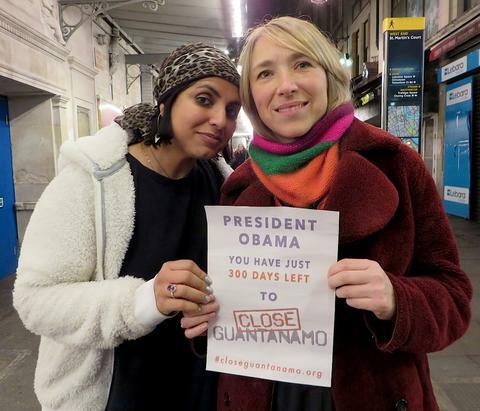 Journalist and doctor Saleyha Ahsan, and Joanne MacInnes, activist and co-founder of the We Stand With Shaker campaign (to free Shaker Aamer from Guantánamo), support the Countdown to Close Guantánamo. Fowzia Siddiqui, the sister of Aafia Siddiqui, whose case is one of the murkiest in the whole sorry saga of torture, "black sites" and disappearances in the "war on terror," says, "I think the detainees have suffered enough and any statements extracted during these horrendous tortures should be dismissed. They should be set free, otherwise they will end up like Aafia, facing a kangaroo trial, vindictive sentence and transferred to another hell hole legalised torture chamber like Aafia, with no contact to family or friends." Aafia Siddiqui was given an 86-year sentence in September 2010, allegedly after trying - and failing - to shoot two U.S. soldiers in Ghazni, Afghanistan in July 2008, after which she was rendered to the U.S. Her family, supporters and lawyers, however, have always claimed that she was actually held and abused in "black sites" for five years after her initial disappearance in Pakistan in March 2003. Also see the Free Aafia Siddiqui and Aafia Movement pages on Facebook. 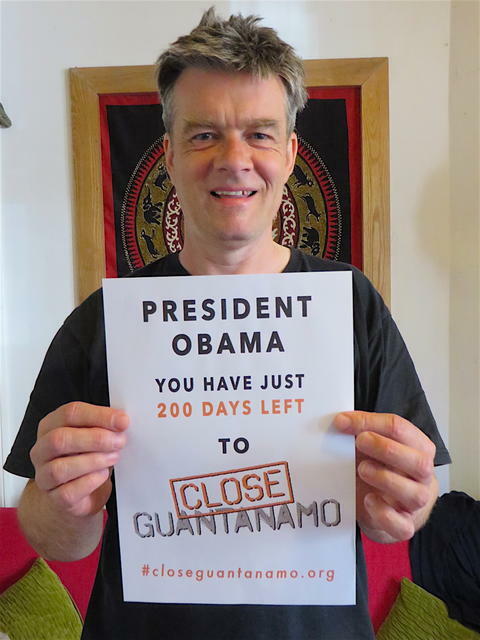 Andy Worthington, the co-founder of the Close Guantánamo campaign (with the attorney Tom Wilner), says, "It is never good news when President Obama goes quiet on Guantánamo. Delivering a plan to Congress is not enough. The President needs to free those men already approved for release, some of whom have been waiting for their freedom for over six years since they were first told the U.S. no longer wanted to hold them. He also needs make sure the Periodic Review Boards continue. To date they have approved for release 20 out of 24 men who, for too many years, were mistakenly described as 'too dangerous to release.'" 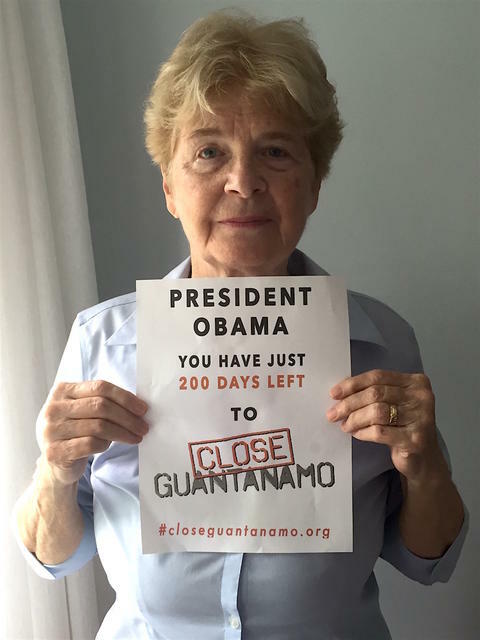 President Obama needs to know that the world is watching, and that he must close the prison as he promised before leaving office. Guantánamo is a legal, moral and ethical abomination, and every day it remains open is an affront to the notions of justice and respect for the rule of law that the U.S. claims to hold dear." 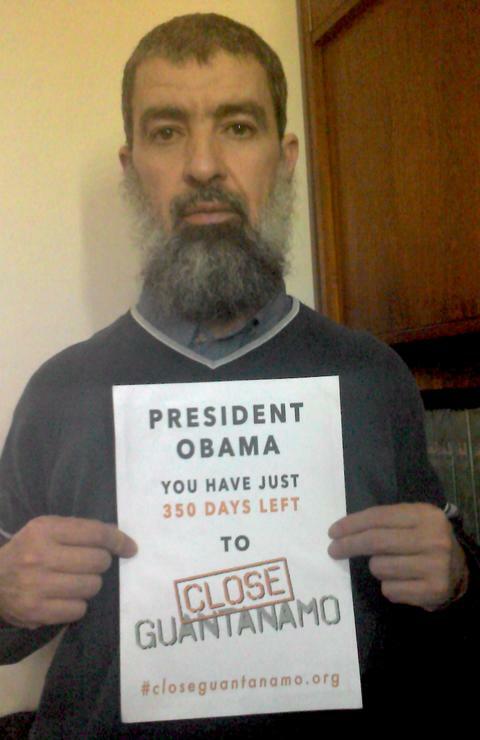 Djamel Ameziane, former Guantánamo prisoner (released in December 2013), says from Algiers, "President Obama, you promised to shut down Guantánamo and you have the power to do it, it is time to close the American offshore Gulag and put an end to a dark chapter in the American history." Todd Pierce and Coleen Rowley, Minnesota, USA. Todd Pierce, Major, U.S. Army Judge Advocate General Corps (retired), represented Guantánamo prisoners as a military defense attorney in their military commission trials. Coleen Rowley is a former FBI agent and whistleblower. 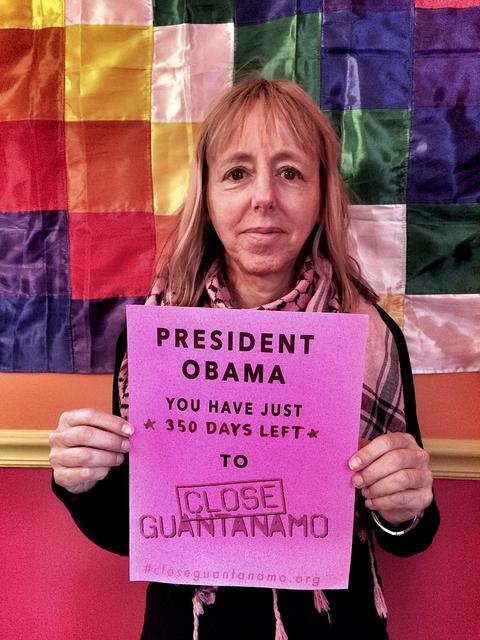 Medea Benjamin, co-founder of the peace group CODEPINK Women for Peace. 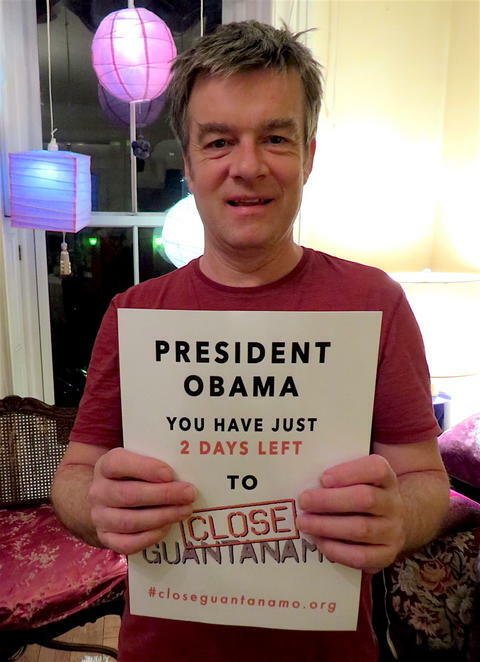 Andy Worthington, the co-founder of the Close Guantánamo campaign (with the attorney Tom Wilner), says, "Time is running out, Mr. President. 91 men remain at Guantánamo, and yet, after 14 years, only ten are facing or have faced trials. 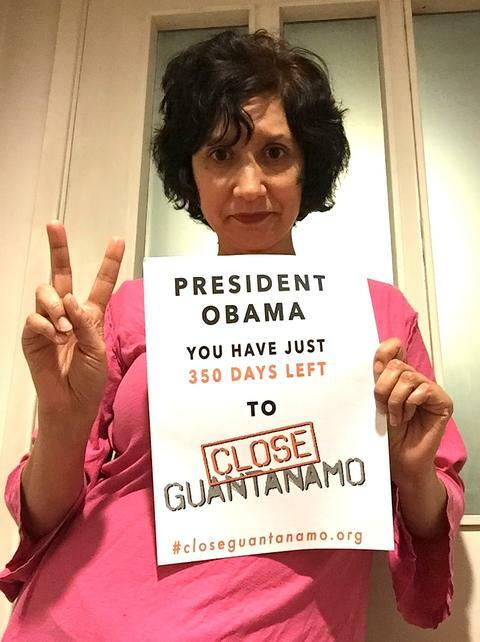 Please recall how important it is to fulfill a promise, and work as strenuously as you can to get Guantánamo closed before you leave office, as you first promised on January 22, 2009." Nancy Mancias, national campaign organizer for CODEPINK Women for Peace. 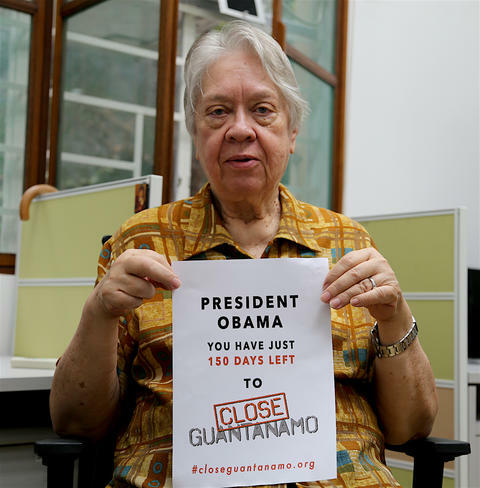 Nancy is an anti-war advocate, and has also been part of the movement against torture and a proponent of closing Guantánamo. She also believes in accountability for war crimes, overseeing CODEPINK's Justice For All campaign. 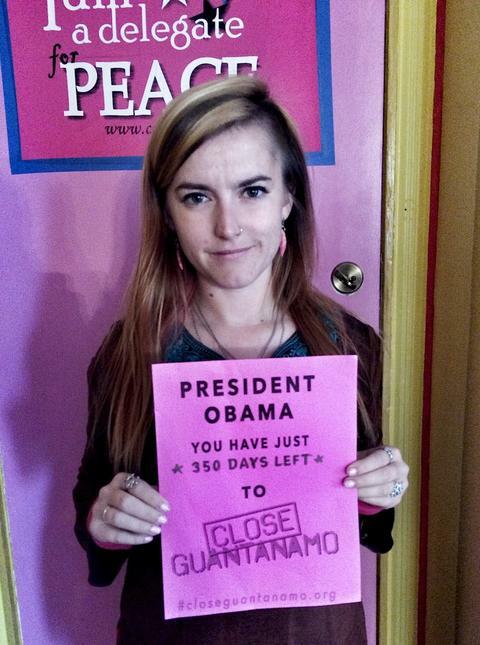 Alli McCracken, CODEPINK co-director from the Washington, D.C. office. David Knopfler, musician, was a founding member of Dire Straits, and is a longtime supporter of the campaign to close Guantánamo. In 2014-15, he supported the We Stand With Shaker campaign, part of the successful campaign to free the last British resident in the prison. Roger Waters, chief songwriter of Pink Floyd. 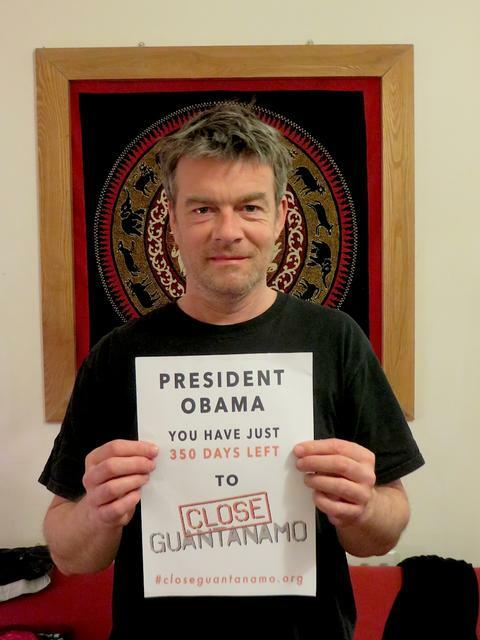 Roger became involved in the campaign to free Shaker Aamer from Guantánamo in 2014, via a letter sent to him by Shaker's lawyer, Clive Stafford Smith, in which Shaker quoted from Roger's Pink Floyd song, "Hey You." 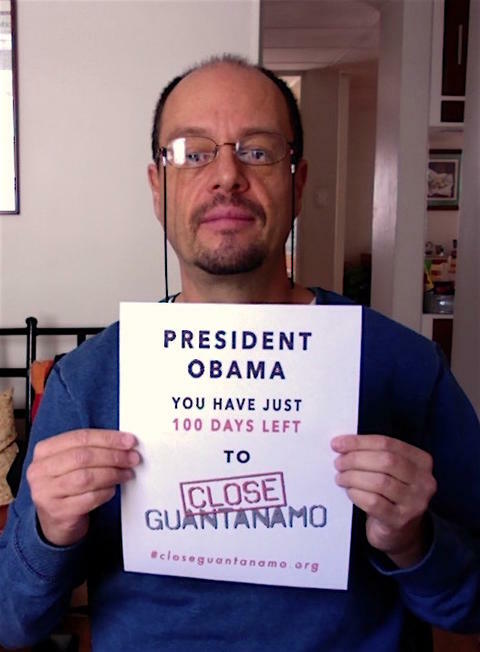 He then became involved in the We Stand With Shaker campaign, and is now supporting the Countdown to Close Guantánamo. 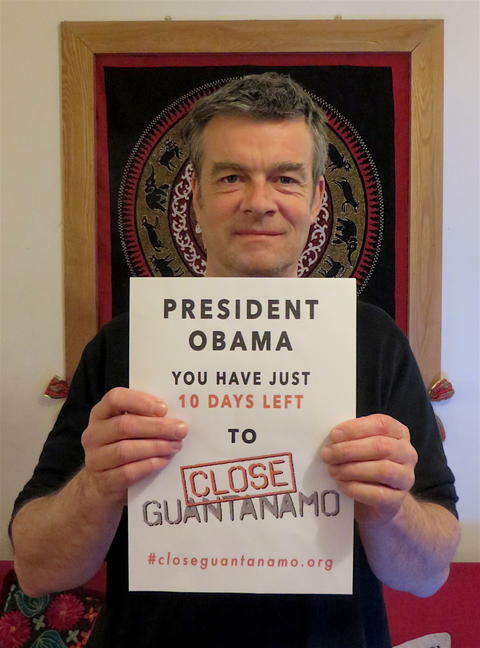 Watch Roger and Close Guantánamo co-founder Andy Worthington on Democracy Now! on January 22 discussing the launch of the campaign. Brian Eno, musician and producer. 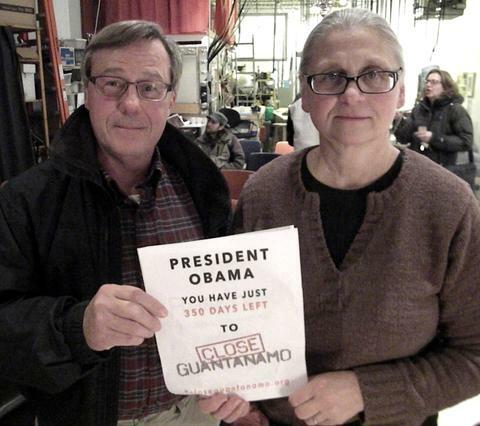 Andy Worthington and Joanne MacInnes, the co-founders of the We Stand With Shaker campaign, met Brian in London in December, and asked him to support the campaign to close Guantánamo in 2016. 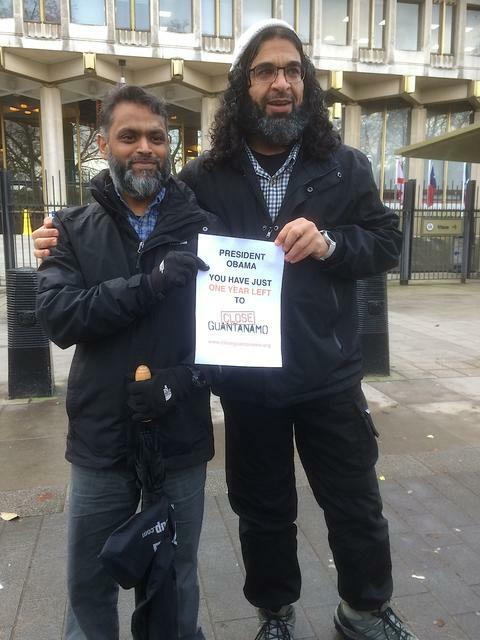 Shaker Aamer, former Guantánamo prisoner, photographed outside the U.S. Embassy in London on January 7, 2016. 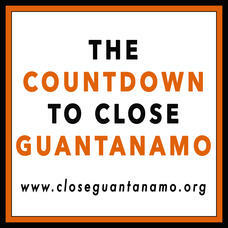 As Shaker said before the 14th anniversary of the opening of Guantánamo on January 11, "I look forward to standing with everyone -- all the brothers, my MP supporters and freedom campaigners -- for this extremely important mission of closing Guantánamo before President Obama leaves office. They might not let us come to America in person, but they can't stop our spirit and our message from reaching the American people and the rest of the world." John McDonnell MP (Labour, Hayes and Harlington), the U.K. 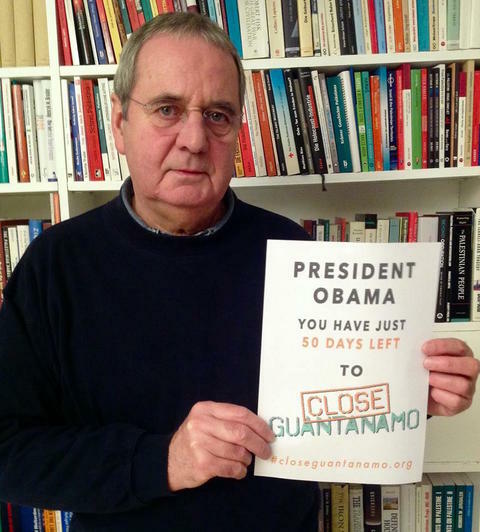 Shadow Chancellor, is a long-standing opponent of the existence of the prison at Guantánamo Bay. In November 2014, he established the All-Party Shaker Aamer Parliamentary Group, and co-chaired it with the Conservative MP David Davis. 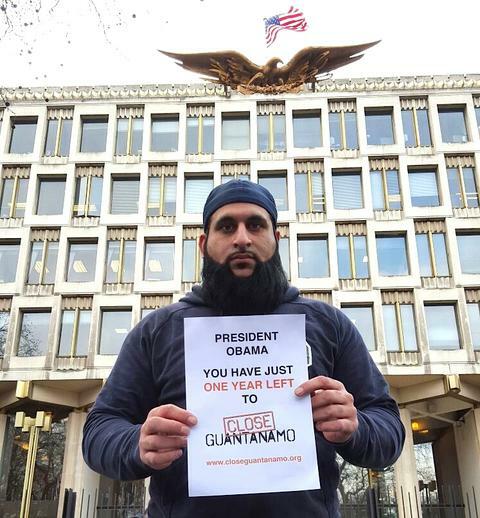 He was photographed on January 11, 2016, outside the U.S. Embassy, on the 14th anniversary of Guantánamo, when he said, "I am chair of the All-Party Shaker Aamer Parliamentary Group and it is part of our campaign to ensure Obama upholds his promises to shut down Guantánamo. This will bring an end to the atrocities taking place there. The reason why it is important that it is shut down before Obama finishes his term is because if it isn't by then there is the fear that it never will." 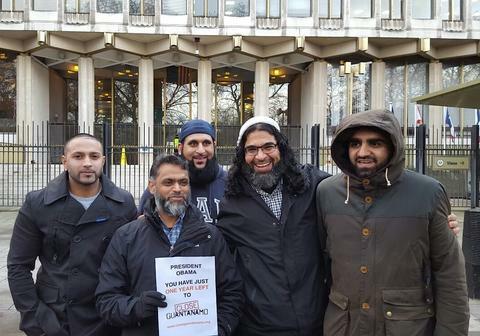 Five former Guantánamo prisoners -- from L to R: Ruhal Ahmed, Moazzam Begg, Shafiq Rasul, Shaker Aamer and Asif Iqbal -- meet for the first time, since the release of Shaker Aamer in October, outside the U.S. Embassy on January 11, 2016, the 14th anniversary of the opening of the prison. Shaker said beforehand, "Even though I've been free for two months, I haven't yet seen my fellow hostages from Guantánamo. This will be a momentous day when we gather for the first time to fulfill our ambition to see the closure of the prison and justice for our brothers still held there." On the day, he said, "We want everybody to know that today we are here not as brothers from Guantánamo [but] for one reason: It’s truly to bring justice back, to close Guantánamo once and for all." See the video here. David Swanson, antiwar activist and author, Charlottesville, Virginia, USA. 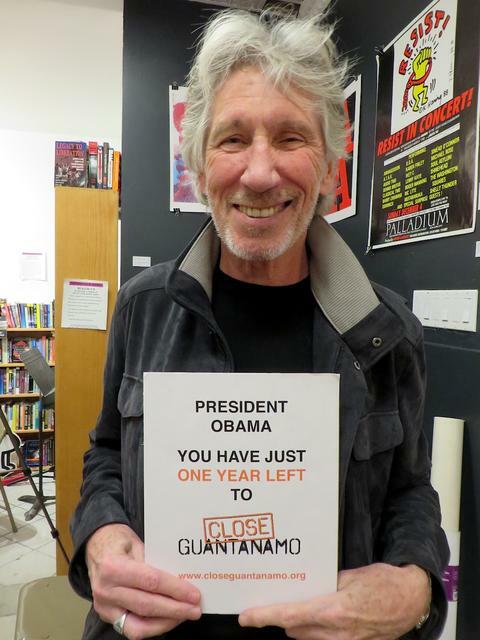 David added to his message to President Obama, "and free the prisoners and give Cuba its land back!" Leah Bolger, Commander, U.S. Navy (retired) and past president of the national board of Veterans For Peace, Corvallis, Oregon, USA. 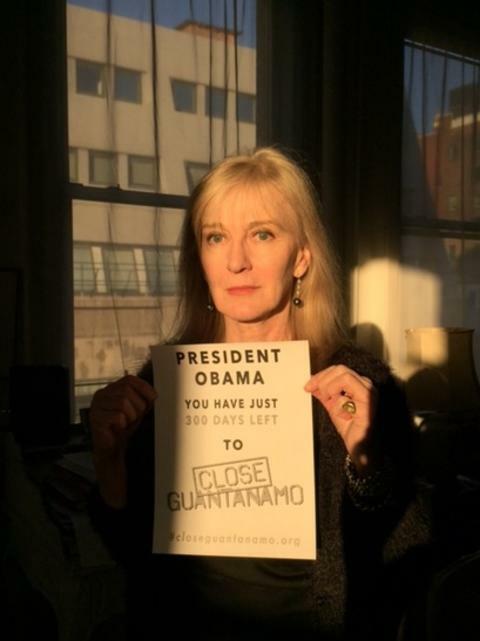 Yvonne Ridley, author and journalist, says to President Obama, "Don't let the Obama Years be defined by torture and Guantánamo. Bush was wrong, he knows he was wrong and that is how his presidency will be remembered. Now it is up to you to put things right. The clock is ticking and the world is watching. Do the right thing." 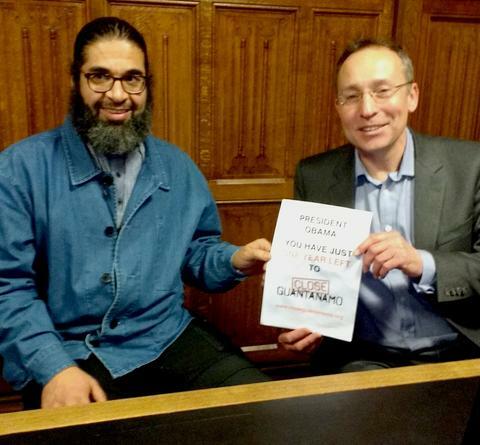 Andy Slaughter MP (Labour, Hammersmith), the Shadow Justice Minister, with former Guantánamo prisoner Shaker Aamer in Parliament on January 19, 2016. 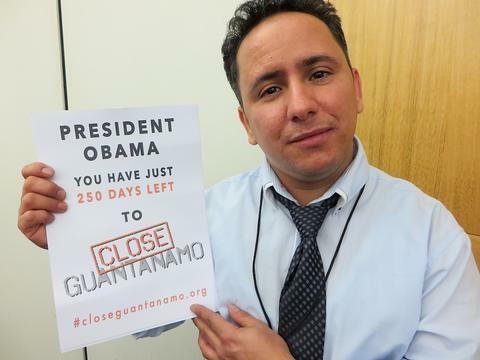 Andy visited Washington, D.C. in May 2015 as a member of the All-Party Shaker Aamer Parliamentary Group, meeting Senators ad Obama administration officials to call for Shaker's release. On his release in October, he wrote on Twitter, "Shaker Aamer will need help to recover from ordeal. 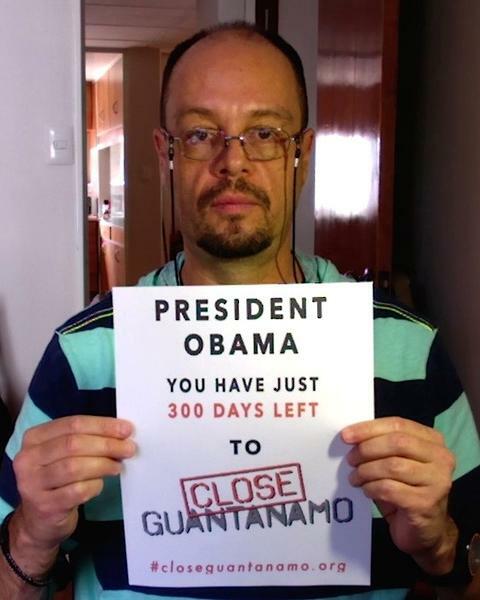 Gov[ernmen]t needs to investigate his detention and treatment and lobby to close Guantánamo." 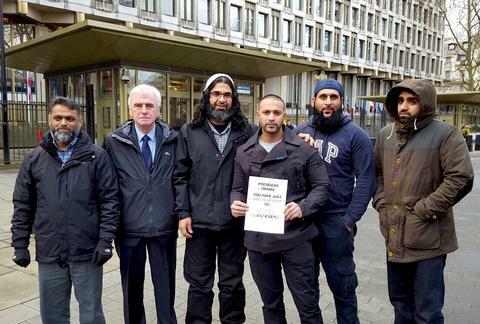 Five former Guantánamo prisoners -- from L to R: Moazzam Begg, Shaker Aamer, Ruhal Ahmed, Shafiq Rasul and Asif Iqbal -- with, 2nd from left, John McDonnell MP (Labour, Hayes and Harlington), the U.K. 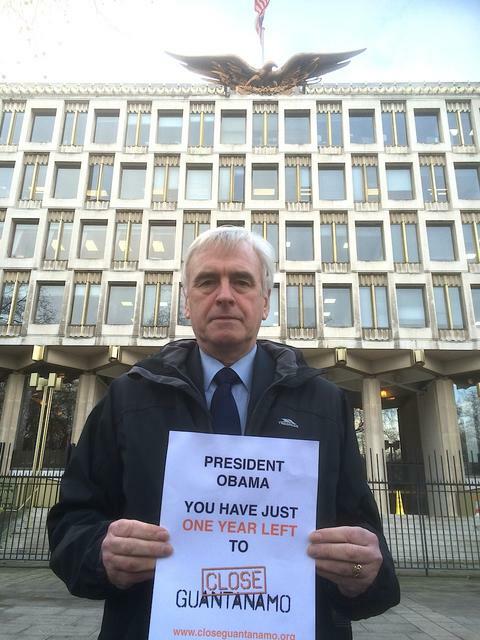 Shadow Chancellor, call for the closure of Guantánamo outside the U.S. Embassy on January 11, 2016, the 14th anniversary of the opening of the prison. Ruhal Ahmed, Shafiq Rasul and Asif Iqbal, known as the "Tipton Three," were held from 2002 to 2004. 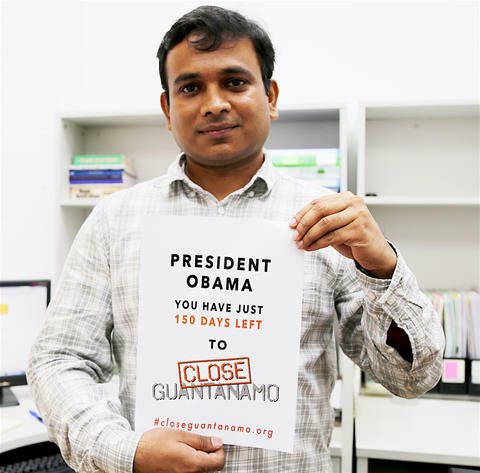 Iqbal said, "We were told by Obama that Guantánamo would close, and we feel betrayed. And it's not just us. The public has been betrayed." Speaking of former prisoners being rehoused far from their home countries, like two Yemenis sent to Ghana earlier this month, he said, "These are people, human beings. They can't just be treated like cattle, prodded and moved about from one place to the next. They need to go home." Ruhal Ahmed, one of the "Tipton Three" -- three U.K. citizens from the West Midlands, held at Guantánamo from 2002 to 2004 -- spoke about Guantánamo outside the U.S. Embassy on January 11, 2016, the 14th anniversary of the opening of the prison, and said, "It’s been kept open by a country who claim to be the champions of democracy and champions of justice. It’s just a joke, to be honest. And it saddens me that it’s open, and I’m out, and I’ve moved on with life, and they haven’t, and they’re still stuck there." See the video here. Shafiq Rasul, one of the "Tipton Three" -- three U.K. citizens from the West Midlands, held at Guantánamo from 2002 to 2004 -- spoke about Guantánamo outside the U.S. Embassy on January 11, 2016, the 14th anniversary of the opening of the prison, and described how there was no justice at Guantánamo. He said, "We were brought up to believe you’re innocent until proven guilty. But while we were there it was the other way around. It was guilty until proven innocent. It just feels that because we are Muslims we are already guilty, guilty of being Muslims, that’s what it is." 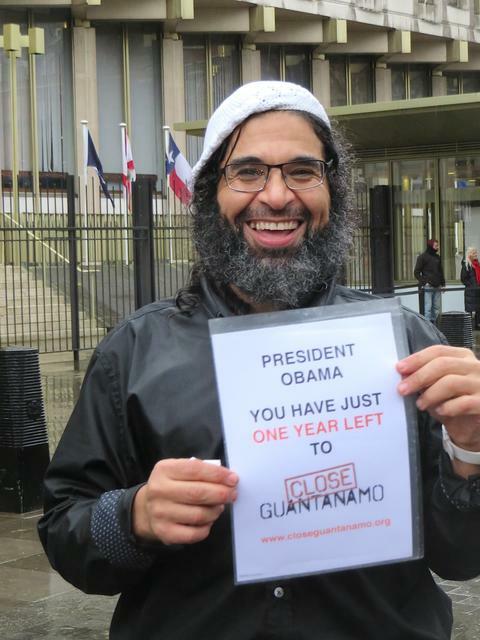 Former Guantánamo prisoners Moazzam Begg (released in 2005) and Shaker Aamer (released in October 2015) call for the closure of Guantánamo outside the U.S. Embassy on January 11, 2016, the 14th anniversary of the opening of the prison. 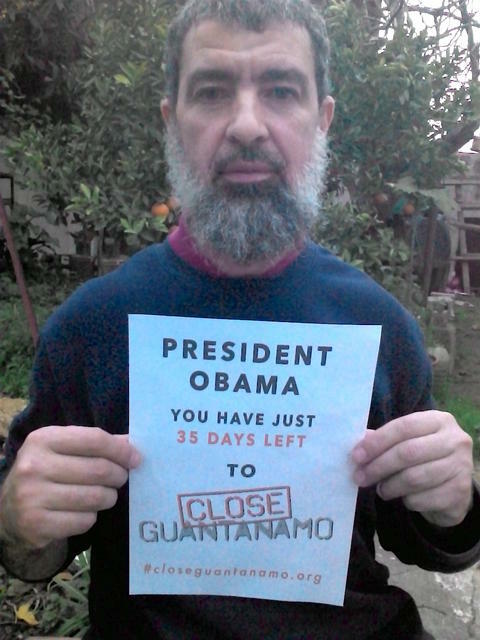 Shaker said, "These  brothers [still in Guantánamo], they are sitting there for all these years. They are not looking for anything but to go home. That's all we ask -- just let them go home to their families." As Vice News described it, he "called on members of Congress to put their differences aside, beseeching them to 'forget about who to blame about Guantánamo' and just concentrate on shutting it down. Closing it down 'is going to bring justice to the Americans themselves. It is going to bring hope to everybody in the world,' he said."